Tools and small equipment have never been as important to job success as they are today. Complex construction requirements combined with technology advancements have driven a need for more specialized and expensive tools in almost every trade. As a result, companies now find that they are constantly shifting expensive equipment from job to job, attempting to keep utilization and productivity high. This is where the trouble begins. When moving equipment and tools from one jobsite to the next, things often go missing, wind up at a different location or accidentally vanish under a pile of wood and tarps in the back of a pick-up truck. Replacing these tools is not only frustrating, it’s expensive and disrupts the operations of the next job as the team searches for the tools they need to do their work. According to writers at ENR, as early as 2003, leading edge contractors were “recognizing the value of trying harder to hold onto tools previously treated as more disposable assets.” This has only grown more necessary and more urgent over the past fourteen years. Not having the tool onsite when it is needed often leads to job delays. Hours can be wasted looking for a tool because nobody knows who currently has it. Wasting money buying double the number of tools needed to avoid the first two headaches. These headaches are getting big enough to disrupt the flow of construction operations, so leading contractors of all sizes are looking at new ways to manage their tool inventories. Having tried the “spreadsheet method,” contractors are now investing in small tool and equipment management systems. The most effective of these can be deployed easily as an “app” on team smartphones and tablets. The time to make this investment has never been better because modern tool tracking systems have made the task of keeping track of tools and assigning accountability easier than ever before. First, you’ll establish a list of everything you own. While this is often the most time consuming step, it sets up the application for tracking each item. Next, you assign tool responsibility to individuals and make it easy to transfer responsibility when a tool moves from person to person. Finally, give everyone in the company the ability to easily search for tools and see who has what. Assigning responsibility is the next step to successful tool management and tracking. To be sure, most companies have a good way to assign responsibility for a tool when it leaves the warehouse. However, transferring responsibility when a tool moves from person to person in the field is normally where manual lists and Excel sheets fail. Field transfers of responsibility are critical because this is where many elements come into play that contribute to where and why tools go missing. Everyday, tools are loaded onto different trucks by different people, adding to the confusion of where those tools landed. A modern system can help this by enabling field workers to transfer responsibility for a tool by simply using their phones. A quick and easy transfer can keep accountability for tools high even as they move from person to person. Field workers need an easy way to search for a tool and see who has what they need. 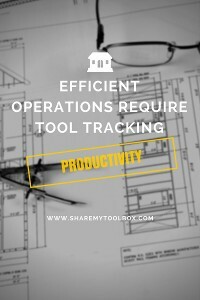 Office workers need an easy way to track where every tool is and who is currently responsible for each. Visibility saves money because having consistent information about where tools are located reduces the re-purchasing of these items. Having real time visibility into where tools are located saves time too because it makes it easy to find tools when they are needed. Most importantly, visibility reduces job delays because everyone can plan better. Every contractor, regardless of trade is realizing how important tool management is to Operations. With productivity at the heart of success for any construction operations team, the impact of tool loss can be immediately felt. Today’s best tool tracking technologies are not accounting or inventory systems. They’re truly operations systems designed for the teams in the field – the ones doing the work – to have visibility into where tools are at all times. It’s simple really – having an efficient way to get tools from where they are sitting unused to where they are needed leads to better field productivity, saves money and establishes accountability. Now that’s effective operations.